Fact is, let’s face it: Transformers is pretty bad. There are maybe five or six G1 episodes that reach the standard of ‘pretty good for a kid’s TV show,’ and the movie is good as a massive confluence of accidents. Beast Wars is the first holistic attempt to create a Transformers series that isn’t just G1, and that it had a plot, or a recurrent theme throughout it was more remarkable than how that was executed. While that final denoument for Dinobot was a wonderful speech and asked some deeper questions about free will, I still feel that a lot of Beast Wars was good only in comparison to G1, which was an incoherent mess of bad storytelling. Impressive for its time but doesn’t bear up on a modern rewatch. Beast Wars is probably the second best Transformers story, but it’s not that intense a competition. Most of the time Transformers media has the problem of scale. The comics are a bit better off for it; they don’t have the same need to show every character economically, and can instead dwell on small groups of characters. The greater war doesn’t need to be shown in action, and the whole vast cast of toys don’t need to be shown as often as possible to give kids as much exposure as possible to the one that they may latch onto as their boy (because they are, so much so, almost all boys). With a hundred characters you can’t meaningfully differentiate in a tiny window of time, lots of Transformers stories wound up being about a fairly predictable cycle where the Decepticons did something, then the autobots came along and fixed it. Beast Wars scaled it down, bringing the forces down to small guerilla squads, but it still had a big world where the only real danger was Other Transformers (yes, the Vok, but shut up). In Animated, the scale is brought way down. Our heroes, the autobots, are a small squad of robots that handle space junk, and they’re so outmatched that at the start of the series, a single Decepticon is the kind of boss-monster threat everyone needs to work together to take out. There’s also the menacing threat in the world they’re at, where some sort of conspiracy keeps producing weird or dangerous robots that they need to try and deal with, and there are third party agents they oppose, and there’s also the orders from Autobot command as well, and there are also human supervillains that mix up the kind of problems our heroes have to deal with. 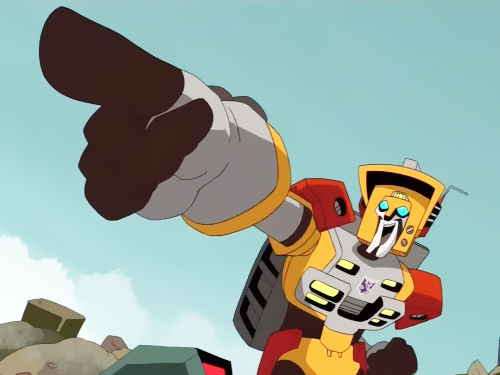 This means that in addition to having a clearer focus, there’s more for our heroes to do, resulting in a fun adventure-of-the-week kind of episodic structure, where one or more of the Autobots gets roped into some kind of problem, and they get to solve it by being who they are. If you took every single episode of G1 Transformers and laid them out, you would be very hard pressed to find a single episode that clearly marked itself as coming after another specific episode. Now, that’s not technically true, per se – after all, some episodes introduce particular transformers, so hypothetically you can say episodes featuring those transformers come after that episode, except, no, that’s not true, because G1 was continuity swiss cheese. By comparison, the plot of Transformers Animated is tight as a drum. Literally every single episode has something in it that relates to a previous episode after the introduction, and that means that each of these individual adventures still has a meaningful part of a greater story. Watch them separately, enjoy them as they stand, but there’s also something more going on. Each season finale pulls these threads together. 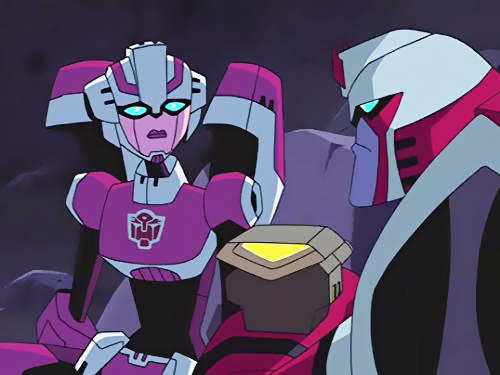 They drive home what the story is about and in the doing they create some of the most important, intense moments in all Transformers media. 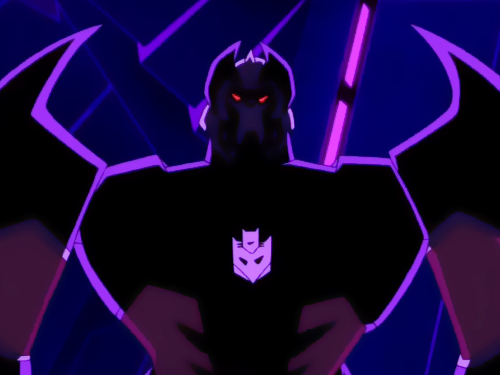 It’s hard to change the established canon, the things that ‘should’ be in a story of this kind, over this many years, but Transformers Animated gives us the spine-tingling, “Decepticons, transform and Rise Up,” which rules. It’s also a wonderful encapsulation of the Decepticons as a force in the narrative; they’re both commonly airborne (and that’s one of the separations between them and the Autobots), but they also perceive themselves as oppressed, and therefore, their opposition is an act of rebellion, not one of conquest. There’s also “That would be the easy way out. You don’t deserve it.” which I feel serves as a perfect coda for the conflict it ends. I won’t go into detail there because it’s spoilery, but it’s a useful one for recognising the way that the speaker is making a choice, but it’s a choice between two justifiable options. The last words of Optimus Prime in the original movie could not do to me what that line does to me. It was not an impassioned speech, not some final words said by someone who had the composure and gift to make this moment about them. It was someone stating their reason for doing what they were doing, and why they were willing to do it. 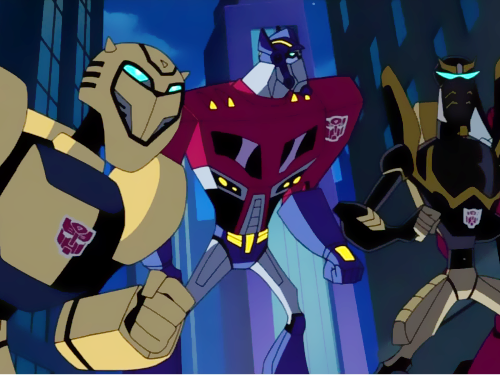 I love Transformers Animated. It’s my favourite Transformers series. If you’ve never seen it, please, check it out.